This article is a short summary of Animal Crossing: New Leaf. 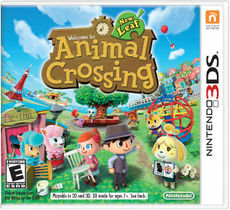 Animal Crossing: New Leaf is the sixth installment in the Animal Crossing series, released for Nintendo 3DS. Originally shown off at E3 2010, the game was released in 2012 in Japan, and 2013 for the rest of the world. Animal Crossing: New Leaf was also released in a bundle with a specially-designed Nintendo 3DS XL system, which includes a copy of the game pre-installed on the system. Keep yourself and your neighbors happy by building a town that fits YOUR lifestyle! Create the perfect place to live. Spend days and nights exploring an exciting world with your amazing new animal friends! Busy days and bustling nights. Decorate and remodel to suit your sense of style. Experiment with new clothes and accessories. Travel to see your buddies, and showcase your home via StreetPass. The charm and creativity of Animal Crossing returns as a Nintendo 3DS™ exclusive with Animal Crossing™: New Leaf, and this time you step into a new role–mayor–where the decisions you make will shape your town and your life. Experience a living, breathing world where new friends and new discoveries await every day—morning, noon, and night. Express yourself by customizing your character, your house, and your town as you create your ideal world. Welcome to Animal Crossing, where as mayor of your own town you make the decisions that shape your town and your life. Experience a living, breathing world where new friends and new discoveries await every day—morning, noon, and night. Animal Crossing: New Leaf is loaded with new characters, items, and activities to enjoy all year long. Customize outfits in countless ways. Furnish your house with an extensive variety of furniture, carpet, and wall decorations to reflect your personality. Then connect with friends to show off what makes your character, your house, and your town unique. The basic gameplay is similar to the previous games. Players are able to interact with the animal villagers and partake in a variety of activities. In Animal Crossing: New Leaf, however, the player is the mayor of the town. As mayor, the player has the responsibility of improving their town for the villagers, and are able to build Public Works Projects, which include objects such as fountains, bridges, and other objects. Using online play, players are able to visit the towns of other players from around the world. 1.1 March 3, 2013 (JP, KOR) Fixes a bug when the game starts up; fixes a crash when the player enters the police station; adds an "Update" option to the main menu, allowing players to download further updates from in the game. In other regions, the version of the game at release is the 1.1 version. 1.4 November 2, 2016 Adds amiibo functionality, adds new items and minigames. The Animal Crossing: New Leaf - Welcome amiibo! release of the game is this version of the game. KOR: December 1, 2016 Fixes a bug that causes a (004-6006) error code to appear when downloading presents or campers, gameplay enhancements. Animal Crossing: New Leaf Nintendo 3DS (Nintendo Selects) NA: August 26, 2016 A re-release of the original game under the Nintendo Selects lineup. AUS: November 24, 2016 A release of the Nintendo Selects version of the game featuring the 1.4 update pre-installed. This release comes packaged with an amiibo card from the Animal Crossing: New Leaf - Welcome amiibo! series cards. Animal Crossing: New Leaf - Welcome amiibo! • Tomodachi Life Double Pack Nintendo 3DS JP: January 1, 2018 A two-pack bundle that includes both Animal Crossing: New Leaf - Welcome amiibo! and Tomodachi Life. ↑ Animal Crossing: New Leaf update on the official website. Nintendo. Retrieved July 20, 2016. ↑ Software Update released in Japan and South Korea, fixes Startup and Police Station errors. Animal Crossing World (March 18, 2013). Retrieved July 20, 2016. ↑ Animal Crossing: New Leaf Has Been Updated To Version 1.5. My Nintendo News (December 8, 2016). Retrieved December 8, 2016. ↑ とびだせ どうぶつの森 amiibo+ 更新データ（Ver. 1.5）配信のお知らせ. Nintendo (November 22, 2016). Retrieved November 22, 2016. ↑ Update page on the official Korean Nintendo website (December 1, 2016). Retrieved December 2, 2016. ↑ Animal Crossing: New Leaf – New update available in Japan (Ver. 1.5). Perfectly Nintendo (November 22, 2016). Retrieved November 22, 2016. ↑ Animal Crossing: New Leaf - Welcome amiibo! on Nintendo's website. Retrieved on September 7, 2016. ↑ "[News] Animal Crossing: New Leaf - Welcome amiibo includes the upcoming update and arrives in stores on 25/11" Animal Crossing UK on Twitter September 1, 2016). Retrieved September 7, 2016. ↑ "Animal Crossing: New Leaf - Welcome amiibo includes the upcoming update and arrives in stores on 24/11 in AU/NZ" Nintendo AU NZ on Twitter (September 1, 2016). Retrieved September 7, 2016. ↑ Nintendo announce 3DS Double Packs. Japanese Nintendo (November 9, 2017). Retrieved November 22, 2017. This page was last edited on 3 November 2018, at 19:49.